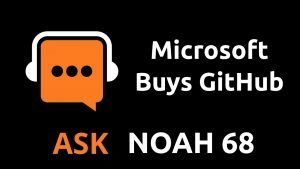 This week on the show we give you the quick and dirty on Microsoft buying GitHub. We speak to Jason Plum from GitLab and he gives us a brief overview of the services GitLab offers and how they’ve worked to create a product that blows GitHub out of the water. Plus a brief overview on what you can expect from Southeast Linuxfest this year!